Bailey is one of the newest members to the Recherche family. She is one of our “granddogs.” We produced her mother Heidi from the first English Goldens we purchased 9 years ago. Her mother is our favorite girl we ever bred… International Ch. Anna & International Ch. Max. We gave breeding rights to the best of the litter and when she had a stunningly beautiful litter, we kept 4 sisters from the same litter. We are so glad we made that choice because all the sisters are incredibly beautiful, well behaved and especially healthy. Both Anna, Max and the mother Heidi scored in the top 4% of Golden Retrievers on their hip, elbow, eye and heart tests. It was no surprise when all of her pups scored as high as we have ever seen. Bailey’s personality is slightly outgoing, confident and loving. She’s not timid or shy, nor is she high energy or hyper. If we ever have an issue with English Goldens, it’s not them being hyper…it’s them being too calm to the point of being timid. Bailey is not shy. She’s confident and not fearful. She is very intelligent and easily trainable. She’s an average to above average size female weighing in right at 65 lbs with a solid white (not cream) coat and a big blocky head. 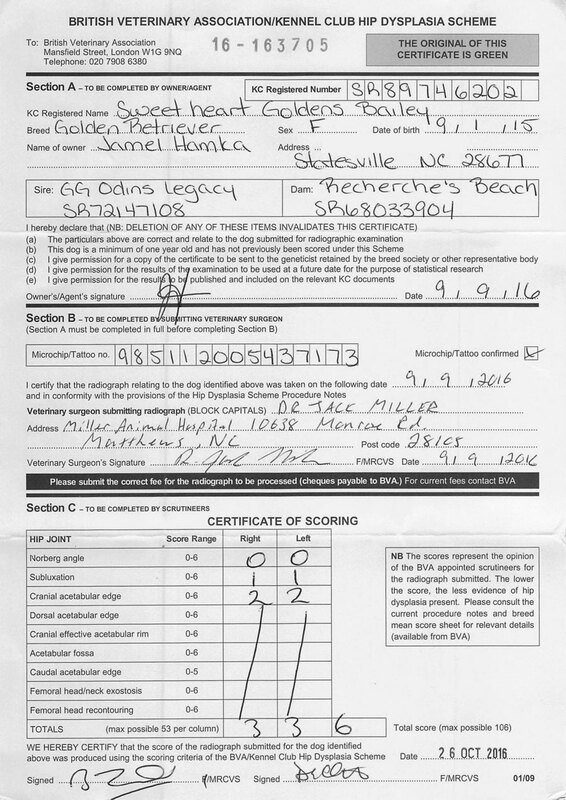 Bailey scores in the top 4% of Golden Retrievers with BVA 3:4 (OFA equivalent “Excellent”) score. She also scored a perfect score with her elbows, eyes and heart clearances. If you study Bailey’s pedigree you will see that she has multiple World Champions, several International Champions & European Champions. She also has several Irish, English, Croatian, Serbian, Polish, Slovakian, English, Dutch, German and many more country champions in her close pedigree! 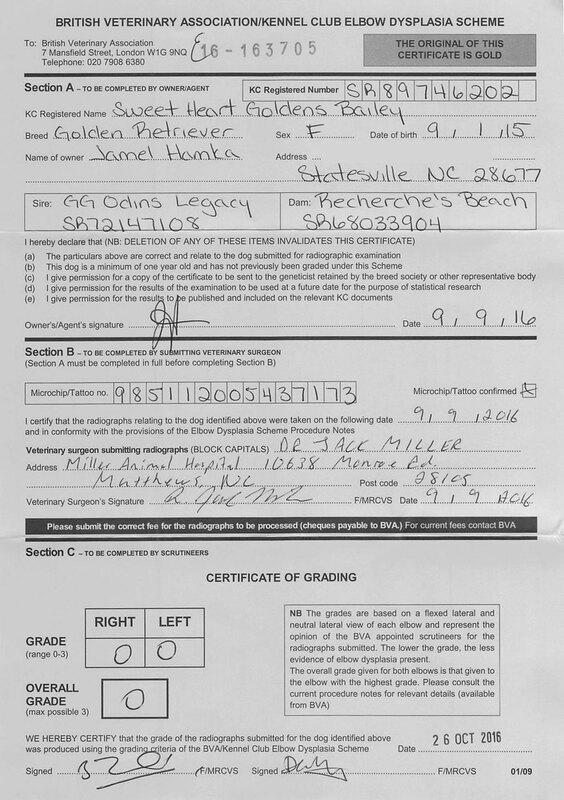 You may click on any of the names in Bailey’s Pedigree to see his/her official K9 pedigree. You can also see most of their official hip and eye scores. Click HERE to see her official k9 pedigree.